ResidentEvil.net will link your score to the world via Facebook and Twitter. What would the world be without stats and rankings? Capcom has added a new service to Resident Evil 6, to help you track and compare your own glorious victories against those of your friends and the world at large. You'll get real-time confirmation of your ranking and status, plugged straight in via Twitter and Facebook. 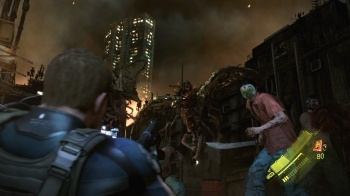 All this comes courtesy of ResidentEvil.net, a free service announced by Capcom at Gamescom. "At a glance see how you rate against your friends and be notified in real-time if they have beaten, for example, your latest Mercenaries score," the press release promises. "Furthermore players will be able to join fellow gamers across the globe and compete in specially organized events." Want a virtual championship belt? Better limber up; there will be regular sponsored matches and online events, with badges and belts for the winners. Achieve the victory condition in the allotted time, or rack up enough of a score, and ResidentEvil.net will tell the world the second you do it. So far this is strictly a PC service, but an app is in the works for phones and tablets. Achievements and badges aren't the only things at stake; in-game currency will also be available, which can then be used to unlock other game features, costumes and other items. The service will be available at launch.